These high-waist stretchy jeans are hands-down my new favorite denim! You can’t go wrong with under $100 jeans that are actually comfortable while still looking good! This night cream is amazing you guys! 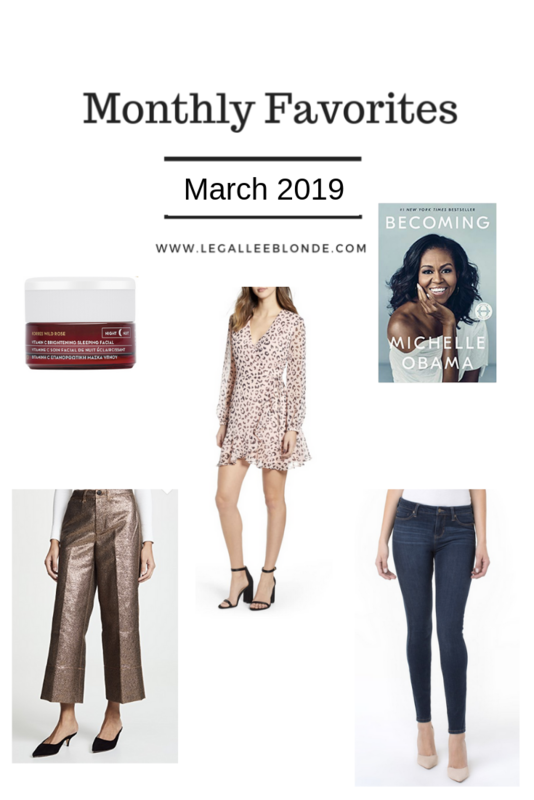 My skin has been really red & dull (thanks winter), but I got this cream in March and have used it once a week so far and the results are incredible. My skin is so much brighter and healthier looking when I wake up after using this! I liked it so much that I’m actually giving one away as part of my monthly giveaway on my instagram! Check out this post to enter to win! Heading home to Ontario to see my family and best friend Maddie’s baby Presley was great. 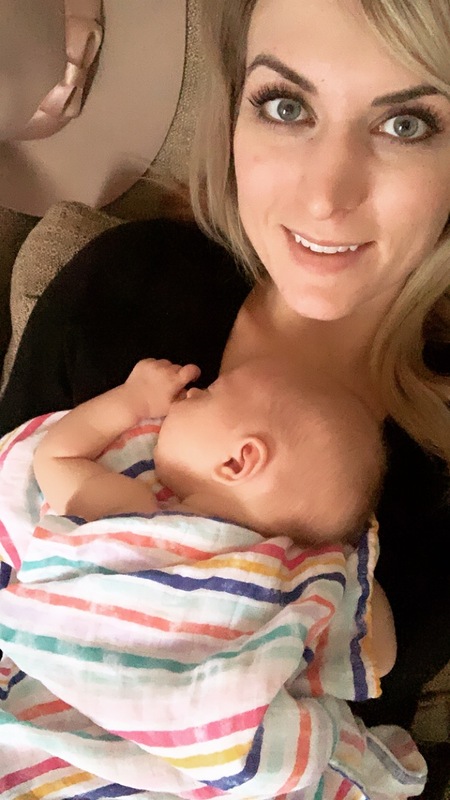 Nothing beats cuddles with an adorable newborn! My friend Britta and I took a Saturday and headed over the border for some shopping in Bellingham. Once a season at least I try to head down for a Trader Joe’s / Target shop and Britta and I had such a blast this time! My friend RJ and I went to see the Michelle Obama tour stop here in Vancouver and it was an incredible night. I’m so inspired by the work Michelle Obama has done and the way she has carried herself in the public eye. I’m about halfway done “Becoming” right now, and I definitely recommend reading it! This was a busy month for blogger events, which was great! Vancouver doesn’t usually have many events so it was a nice to change to have a bunch of great brand events this month. 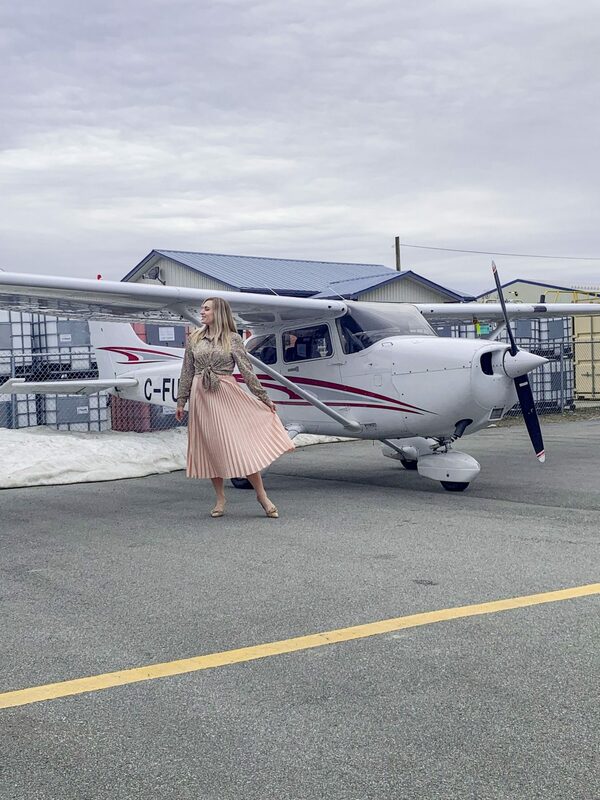 Two of my favorites were the brunch with Kia Motors at an airport hanger, and the Poshmark Canada launch party! Since I’ve been so sick this month, I’ve watched a lot of TV. Season 3 of the Santa Clarita Diet just came out and it is such a funny, creative show. Check it out if you haven’t seen it yet! Yep, I am one of those people who is still watching Grey’s Anatomy! I can’t be the only one?! This month I caught up on the new season, and oh my gosh the most recent episode was incredible. Honestly I think it should have come with a trigger warning for sexual assault, but other than that, I was so impressed by how they handled such a difficult topic. I think part of why I like Grey’s Anatomy in general is Shondra Rhimes’ ability to address current socio-political issues. My favorite post from March has to be the baby blue suit, only because of how much you guys all loved it. This was my highest viewed and most shared post of the month! I really enjoyed sharing more about me, and I love this outfit so this post definitely makes my favorites of the month. Written for International Women’s Day, this post felt very personal and very important to me. While it’s titled dear female lawyers, I think the heart of it applies to women in any field. If you haven’t read it yet, I would love to hear your thoughts. As the title implies, this is a travel guide for Marrakesh. I just loved Mollie’s Marrakesh photos and am definitely wanting to plan a trip there asap! This is making me want another cross-border trip! I haven’t actually spent much time in Seattle, and considering I’ve lived here in Vancouver for 4 years that’s just crazy. This spring/summer I want to do a Seattle weekend getaway. This drink looks amazing!! I have been pinning spring/summer cocktails like crazy this month – I can’t wait for backyard BBQs this summer! This peach mint smash though is definitely my top pick to try. "Metallic Culottes & 10 Things You Don’t Know About Me"
March was so busy for you! I love that pink skirt, and those pants from a recent post. You’ve got such great style! Haha it’s funny (or sad?) because to me I’m thinking March wasnt busy at all! I’ve been all mopey about it! Looks like you had a marvelous and busy March babe. I am obsessed with those metallic pants in the beginning. Thank you Laura! Have fun on your Costa Rica trip girl!! What a fun month! Your friend’s baby is too cute!!! Love your pink skirt and pink hat!! Thank you so much! And haha isn’t she adorable! I’m obsessed with her lil cheeks! I love your list! I just got a leopard skirt from H&M, I’m obsessed!! Thanks Sarah! And ahh I still need a leopard skirt- Ive got a few tops and a dress, but still need a skirt! I’m still a die hard Greys fan!! Yasss, glad Im not the only one! Sounds like such a great month! 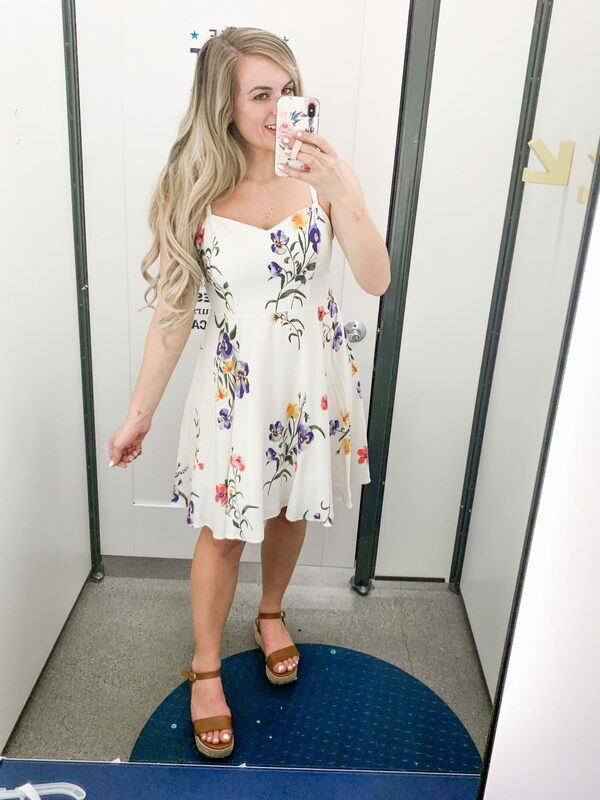 I am loving that fit and flare dress as well, so cute and perfect for Spring! Thank you so much for including my peach cocktail! It’s such a great summer one to try. Great post! I love that dress at the top and I’ve been reading Becoming as well! Great read! Thanks! And isn’t it! Now I just need to find the time to finish it! Oh wow that airplane pic! What a fun blogger activity! I also LOVE that first spring dress and of course doesn’t get much better than reading Michelle Obama’s book! It so was! nice to do something so unique for an event! Still loving those jeans on you!! And that was so awesome for you that you got to see Michelle Obama speak .. happy that you were feeling well enough to go that day after being sick! Thank you so much Morgan, it was definitely a struggle to get there, but I am so glad I went! Fabulous pleated skirt! Have a great April!